John Beatty’s brigade is taking a pounding at the McDonald Farm. The 42nd Indiana falls back to join with the 88th Indiana, but the two are quickly overwhelmed by Adam’s Brigade and are forced to retreat. The two regiments never rejoin the battle, wandering around the McFarland Gap road to the west and eventually making their way to Rossville. 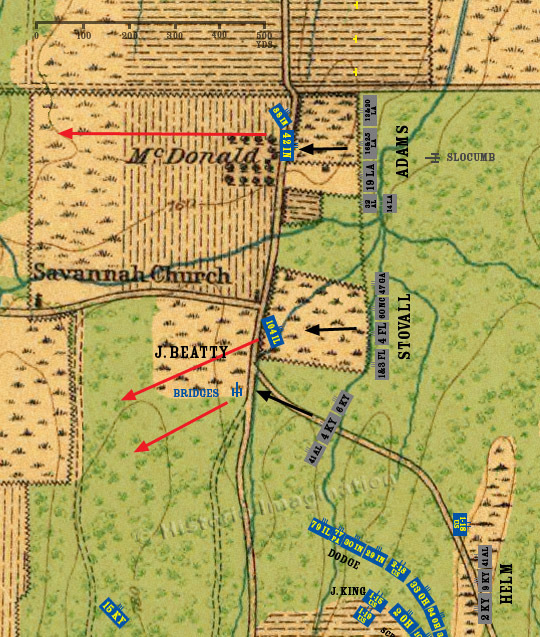 The 104th Illinois is also routed by Stovall’s Brigade. Likewise, Bridge’s Battery is overrun by the right regiments of Helm’s Brigade and forced to retire.